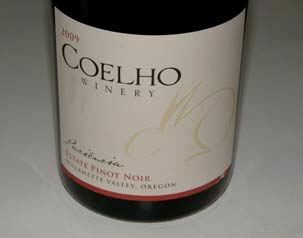 A family-run winery owned by Dave and Deolinda Coelho (KOO-AY-lo, rabbit in Portuguese) who produce single-vineyard, estate-grown, terroir-driven Pinot Noir with small amounts of Chardonnay and Pinot Gris. Honoring their Portuguese heritage, they also make Port-style dessert wines and Duoro-style table wines. The Coelhos farm three vineyards of about 50 acres within 5 miles of the winery in the McMinnville, Eola-Amity Hills and the soon-to-be-approved Van Duzer Corridor AVAs. The winery is located in downtown Amity in a renovated 1930s-era former hardware store, also housing the tasting room since the 2004 vintage. Chris Bertsche, the assistant winemaker at Trisaetum, took over winemaking in early 2016. The tasting room is open daily from 11:00 a.m.-5:00 p.m., serving cheese plates. The tasting room is also available for private tastings and events.